Yesterday’s run was a significant milestone, if only psychologically, in my marathon training plan. My schedule called for a 10 mile “long run.” I had not run that many miles since the Grand Rapids Half Marathon in October of 2015. I found it hard not to think about it for several days. The distance, of course, was one concern. My 8-miler the week before was not a great one. Vicki and I were travelling “up north” for a weekend in our very favorite place, Petoskey, Michigan. 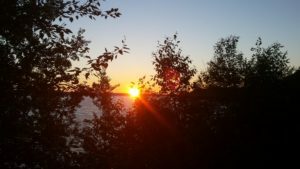 A visit to Petoskey is always a wonderful experience, but with a stop at Sleeping Bear Dunes on the way up I would be driving for more than 6 hours the day before my run. Another concern was running an unknown course. It’s important to me to know where I am going and, more importantly, how to get back. The combination of mild anxiety over the upcoming run and being in a hotel rather than home resulted in little sleep Friday night. This is not good before a long run. Perhaps the only positive was I had no trouble being awake at 5 AM. I got up, dressed, grabbed my gadgets and walked the quarter mile to the Little Traverse Wheelway, a paved bike trail that runs along Little Traverse Bay and Lake Michigan from Harbor Springs to Charlevoix. The sun would not break over the horizon for a good ten minutes, but there was enough light to clearly see the trail. I headed south toward Charlevoix. After running a little over a mile I looked over my shoulder and saw a magnificent sunrise behind me. I had to stop and take a picture. That stop would be the only one of the entire run. The miles passed easily as I took in spectacular views of the bay and the lake. Portions of the trail took me through woods. The views were stunning and the shade was refreshing. I can’t remember ever running in a more beautiful place. ← But Weight! There’s More! Love reading your blog! Training on perceived rate of exertion has been so challenging for me because I’m so used to having my real time data on my wrist. Bet the miles were faster than you expected. They were! Did the last mile in 9:07! Thanks for these posts, John. You’re an inspiration. I feel the same way about my cycling. I can’t do the long, fast rides I did in my 20s. But if I listen to my body, and find a comfortable pace, I’ll go forever, without decimating my body later. I can still do 30 miles. It just takes me 2 hours. Thanks,Dave! I really believe staying active keeps us young.